At home I've got two art studios, a tool/workshop, an art storage room, garden space, and yet somehow I invariably end up (project size permitting) working in the kitchen. I guess it's because that's where the food and kettle also live. 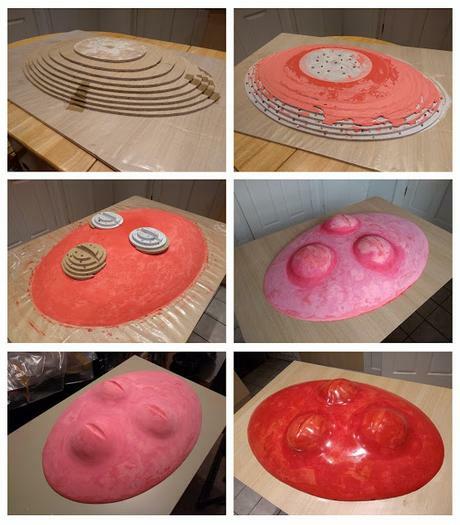 My current 'kitchen project' is the creation of a plaster mold. 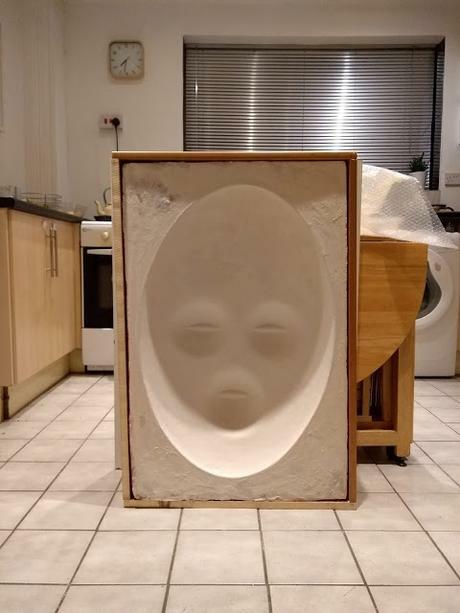 Once the mold is completed I plan to use it to produce a new series of giant wall-mounted face mask sculptures, all made from different materials. The first in the series will probably be made using human hair but what I'm really looking forward to doing is making some mosaic versions. I've already started collecting royal commemorative mugs and plates - the smashing up of which, should be fun. For the actual design of the face I wanted to keep it simple and gender/race-neutral so I went for a very stylised form - which ended up looking not unlike a simplified version of a traditional African mask. I wanted to draw attention to the similarity in structure of the mouth and eye lids so deliberately made them the same size and shape (although I had to add a little extra to the bottom of the mouth to help attach it to the rest of the face and to keep it in a parallel plain to that of the eyes). But before I could make the mold I had to make a positive, from which to cast it. I had originally intended to make it from clay but after weighing up the pros and cons I decided that I'd probably be able to get it more symmetrical if I constructed it using a ridged base structure, coated in some sort of plaster. After casting my mind back into the mists of time, to what I could remember from my school days' Technical Drawing lessons, I worked out the shapes needed to built an elliptical mound from recycled vinyl-coated chipboard. 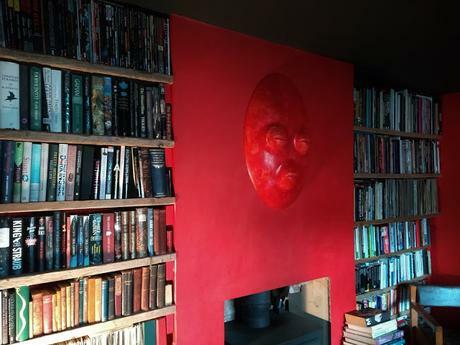 Once that was built I covered it in coats of wall filler, mixed with acrylic paint. After I'd given it a roughly even coating I made the chipboard structures for the eyes and mouth, and screwed them into place - then coated them in the same acrylic/plaster mix as before. After that I sanded the face down to a smooth finish and coated it in varnish. I had a bit of trouble with the varnish (using a two different types, and stupidly, in the wrong order), which meant that the top layer didn't properly dry. This meant that when I came to give it a final sanding, there was an area that I couldn't get perfectly smooth (but I can sort this out at the mold stage, by sanding it once it's become bone dry). To make the mold I spent hours (far more than initially expected - as is usually the case) applying a putty around the edge of the positive, to fill in the gaps where small pieces had chipped off, and so that there would be no undercuts in the mold after I poured the plaster of Paris. I then constructed a wall (sealing the edges with silicon sealant) around the positive, to contain the plaster. Next, I covered the positive in petroleum jelly and washing up liquid. This acted as a release agent for when the time came to separate the mold from the positive. I'm not sure if it was because the plaster was a bit old, but when I came to pour the first layer of it over the positive it started setting pretty much as soon as it left the mixing bowl. So I had to clean it all off the positive and start again. Anyway - using a first layer of plaster of Paris poured over the positive, I then mixed up more and added it, along with strips of webbing for reinforcement. Next, I incorporated sheets of chicken wire (for more reinforcement) and builders plaster - followed by expanding foam and a foam bard. The foam was to act as shock absorption and hopefully help prevent the mold from cracking, should it get knocked. 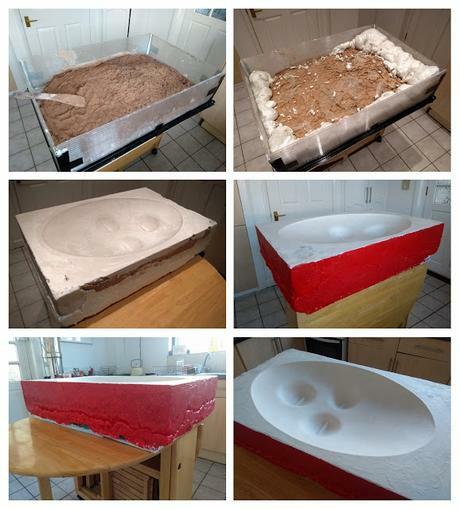 It was also to help reduce the overall weight of the mold as it was already, by this point, bloody heavy. Once the plaster was set I removed the temporary walls, removed the positive (which thankfully fell out when I turned the mold on its side. I had feared that it would be stuck fast and I'd have a hell of a job to remove it), cleaned up the mould, and painted the sides of the mold with acrylic paint to protect the exposed areas of expanded foam. Apparently it degrades somewhat when exposed to light. I then decided that I hadn't strained my back quite enough moving the mold around so proceeded to make it even heavier by building a protective wooden frame for it. One of the positives (please excuse the unintentional pun) of making the positive the way I did, is that it survived the mould-making process. Something that it probably would not have done if I'd made it out of clay. So, after knocking up a metal fixing plate for the back of the positive, I ended up with something a bit more substantial to occupy the wall space above my log burner. To misquote the Duke, "The wall mask really tied the room together". Now all I have to do is wait for the plaster mold to become bone dry - which could take weeks given the size of the mold and the current temperature (not helped by the fact that I like to live in a relatively chilly house; something that I probably picked up from all those years of living in warehouses, garages and ex-shops. Artists eh?). Then I can sand it to a smooth finish, seal it, and it'll be good to go.